Time and time again, I have booked a healing session to soothe my nerves, only to receive the same intuitive message from the practitioner: Take Your Bach Flowers! It's like my guides are pulling my ears for neglecting myself that way. Flower essences are part of a system known as vibrational healing, where we draw on the peace and love frequencies in the plant kingdom to balance our own energy. We can use them to cope with stressful situations or to heal our emotional footprint and become well-adjusted and emotionally sound folks. My experience with flowers remedies has been casual so far, I still have a lot to learn. It's a funny story, but I discovered Bach Flowers long before I had heard of energy healing or Reiki. Back in 2003, I was a full-time MBA student at one of Mexico's leading business schools. The stress levels were sky high, roughly 10% of each incoming class would flunk out during the first year. There was pressure to shine, tons of reading material and three debates to prep for every day. To make it worse, our comments were graded on the spot: A, B, or Fail. How To Keep Your Cool? Believe it or not, one of our corporate psychology professors held free, on-site Bach Flower consultations for overworked MBA candidates. At the time, I vaguely knew that flower remedies were similar to homeopathy; that they could help us cope with stress. Half of my classmates visited his office once a month to stock up on Bach Flowers. I was curious, but I didn’t take the bait just yet. Fast forward seven years, and one day, I found myself in a tricky situation at work. I had been phased out of a job that I loved, though I promptly found another in the same company. The new role was much better for my career, a promotion, but I still had mixed feelings about the way things happened. I didn't want that sense of disappointment to undermine my new start. That’s when I finally decided to try Bach Flower Remedies. I have always been a Do It Yourself kind of gal, so rather than book a session with a practitioner, I went to Whole Foods Market to have a look at the Bach Flower Remedies. There are 38 Bach Flower Remedies, for different emotional and mental states. It's a simple system, we can read the descriptions and choose the ones that resonate. For example, Hornbeam is for "feelings of exhaustion and tiredness before an effort has been made," whereas Scleranthus promotes decisiveness in people who have trouble making up their minds. Impatiens is for hasty types who want everything done yesterday, and the frustration that can create. Given my state of mind at the time, the one that stood out was Willow, for self-pity, bitterness and resentment. This remedy gets us out of the "poor me" attitude so that we stop being victims and take charge of our lives. I also left with two additional remedies to help with motivation and energy levels. In this way, we can use remedies to deal with temporary setbacks or stressors. We all have personality traits that limit our potential. Maybe it's a tendency to doubt or underestimate yourself. Or to sabotage romantic relationships with unfounded jealousy. We all have our personal sticking points. 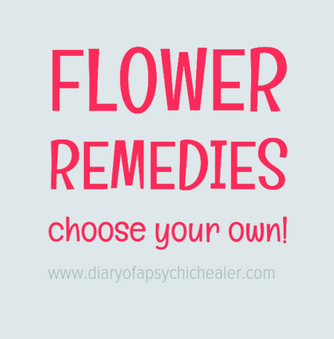 The flower remedies can help us curb that those patterns before they cause problems. Clematis: Grounding for those of us who live in dream worlds. Clematis brings our attention back to the present moment, so we can take action. Mimulus: Anxiety over specific things, in my case: public speaking. This helped tremendously, or I wouldn’t be hosting a weekly radio show. Reading the descriptions for the full range of remedies is one way to go; the book is available for free on the Bach Centre website. Another would be to look at our star signs and choose the vibrations that figure prominently in our birth charts. As luck would have it, the essences I chose to balance my personality were linked to my Moon and Past Life signs. Keep reading for a crash course in astrology!